So, like actors on the classical markets, both producers and large scale consumers of energy face risks and seek protection from these risks by structured contracts, so-called energy derivatives. In the gas and electricity markets for example, so called ``swing options'' have become very popular. A typical swing option gives the holder the right to buy or sell a certain amount of gas, electricity or storage capacity at a certain prescribed number of trading dates. Another issue in the energy markets is the fact that some forms of energy (in particular, oil, gas, and hydro-electric power) can be stored physically. Storage facilities thus allow for anticipating and exploiting market fluctuations of energy prices. Initially, such facilities were only accessible by major players in the respective industries but meanwhile, due to the emerging liberalization of the energy markets, all participants have the possibility to trade storage services via storage exchange platforms. As a consequence, market players are faced with optimal decision problems involving, for example, buying, storing, or selling energy over time, exercising certain energy contracts and so on. 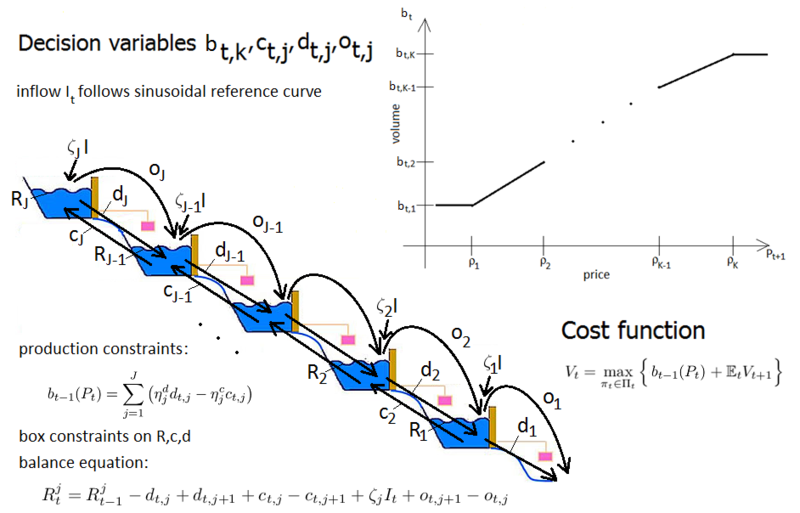 Therefore, on the one hand, design of optimal strategies for complexly structured decision problems is called for, and on the other hand, a high demand of adequate statistical prediction algorithms based on adequate statistical modeling of market prices is arisen. Generally, the aim of solving an optimal decision problem, that is an optimal stopping or optimal control problem, is twofold. On the one hand, one aims at bounding its ``true'' value from below and above, and on the other hand one tries to find a ``good'' decision policy consistent with these bounds. In fact, a ``good'' (primal) decision policy yields a lower bound, and a ``good'' system of (dual) martingales yields an upper bound to the ``true'' value, respectively. Thus, naturally, solution methods for optimal decision problems can be classified in primal and dual approaches. For the standard optimal stopping problem, [BBS] succeeded to avoid the time consuming sub-simulations in the Andersen-Broadie algorithm by constructing the dual martingale via a discrete Clark-Ocone derivative of some approximation to the Snell-envelope, obtained by regression on a suitable set of basis functions. Later on in [SZH] a related regression method was developed that also avoids sub-simulations and, even more, does not require any input approximation to the solution of the problem (i.e. the Snell envelope). Particularly the later approach looked promising for generalization to quite general control problems. In this respect, in a preceding project SE-7, Optimizing strategies in energy and storage markets, a framework for regression based methods based on the dual martingale approach has been developed for solving quite general decision problems. As a first non-trivial application, this method was successfully applied in the context of a hydro electricity storage model HSZ16. One of the main goals in this project is a systematic numerical treatment of generic optimal decision problems in ``real-life'' applications by incorporating recent ideas of a relatively new concept of data analysis and prediction: Deep Learning. On the other hand, we include principles of Deep Learning in methods for forecasting and estimating price distribution processes in a systematic way. With Prof. Denis Belomestny from Duisburg-Essen University we cooperate on topics in Deep Learning and on theoretical analysis of regression based simulation methods connected with the field of empirical processes. [BBS09] Denis Belomestny, Christian Bender, and John Schoenmakers. True upper bounds for Bermudan products via non-nested Monte Carlo Math. Finance, 19(1):53-71,2009. [SZH13] John Schoenmakers, Jianing Zhang, and Junbo Huang. Optimal dual martingales, their analysis, and application to new algorithms for Bermudan products. SIAM J. Financial Math., 4:86-116, 2013.